A 26-year old French athlete Samir Ait Said has broken his leg in one of the most horrific injuries we have ever seen at the Olympics. Samir broke his leg while landing during a vault in men’s qualification event in the Rio Olympic Arena. The sound of his breaking leg could be heard while the camera was cut away. French team leader, Corrine Moustard-Callon, confirmed that Ait Said had broken his left tibia. “He made a technical mistake. He is in the hospital with a doctor now,” she said. “We will give more news when we have it. We don’t know what happened, except that it was his tibia. US gymnast Samuel Mikulak competed on the vault immediately after Ait Said, and said he heard “a bunch of ‘Oohs'” from the crowd. Samir bids farewell with a broken leg after his dream to get gold is shattered. “I just made sure I stayed focused on the routine I was about to do. It’s always a shame when there’s an injury. This sport is absolutely brutal,” he said. 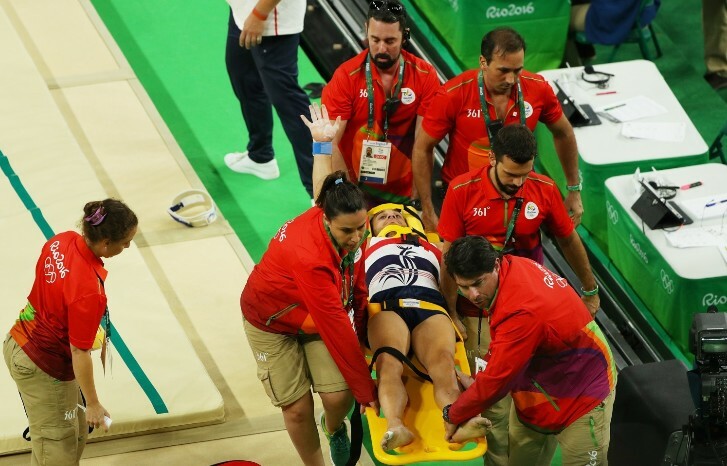 Ait Said, who competed at the World Championships in Glasgow in 2015, was taken out of the arena on a stretcher. He acknowledged the crowd as he departed, raising one arm in response to their applause. The Frenchman won gold on the rings at the 2013 European Championships and silver on the same apparatus in 2015. Footage of the accident immediately started circulating on social media, but many advised people simply not to watch it.